Now for a much darker review, featuring Salem (Oregon) sludge/doom band Hell. III was Hell's third full length and was released in 2012 by Pesanta Urfolk and Eternal Warfare, on LP and tape respectively. It's two tracks lasting nearly forty minutes. Hell's lone multi-instrumentalist M.S.W focuses on recorded output, while playing live shows with a full band. 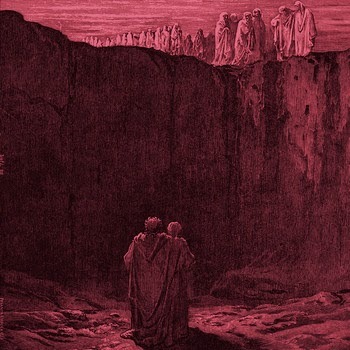 A split with Thou saw the light of day the same year as this release and as I've only recently reviewed Thou's latest record, I thought I would pay Hell the same level of attention. I’m venturing into the unknown again here, as Hell are not a band I’m too familiar with minus what I’ve read in various publications. Mourn starts off with folk-influence guitar. The melody it creates is calming and almost dreamy, though you get the sense that it won’t stay like that for too long. The song builds slowly, with added drum and bass layers making themselves known until the five minute mark when the heaviness sets in. The screams are blackened and bleak. The low-end becomes more prominent as the song flows on and feedback fills the record with menacing atmosphere. Mourn ends how it began, with more clean guitar work, as it fades out. Decedere features strings during it’s introduction, which further develops the folk-influence and opens up the song before a few seconds of silence. Hell build slowly with gently plucked guitar, which sees them stepping away from blackened funeral doom for a brief time. The clean female vocals add to the occult sense of the band and brings out the character of the record, before hopes of solace are dashed by more jagged black metal screams. The music underneath remains melodic though and the band choose not to make use of the feedback that was carried through Mourn. Don’t worry though, it’s not gone for long though as it mixes with the rumbling bass tones to drag you back into familiar territory. Decedere weaves through many different movements, each creating a separate atmosphere yet still staying true to Hell’s approach and sound. Despite their billing as a drone/doom band, Hell are so much more. The variation and breadth across these two song on III really make it a pleasurable listen and one which is accessible to more than just the ardent doom fans that plough deep furrows in the underground. Brilliant. You can purchase III as a digital download and buy other merch from the page too. Eternal Warfare are currently working on setting up an online store. Hell are not on social media.